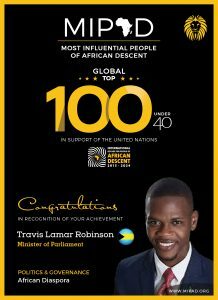 At 22 years old, Travis Robinson became the youngest MP to serve on a country’s legislative body in the Caribbean. Two weeks later he was appointed Parliamentary Secretary for Tourism. Mr. Robinson founded The Rising Star Organization, a mentorship organization which trains and empowers young student leaders to become world changers. Mr. Robinson has launched local projects in his constituency such as the Bains and Grants Town Center for Academic Development to give residents the opportunity to develop their skills and learn about entrepreneurship. We are proud of what he has achieved and recognize him as one of the Most Influential People of African Descent Politics and Governance Category.